Pour some brown paint on the paper plate. Put your child’s hand in the paint. Have your child put a hand print on the white paper. Wash your child’s hand while the paint dries a little bit. Glue the 4 feathers on top of the hand print fingers. Cut a small triangle out of the yellow construction paper. Glue the triangle onto the front of the hand print thumb for a beak. 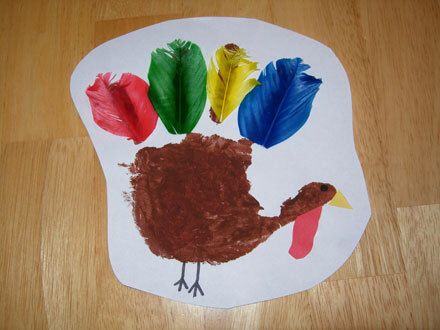 Cut a turkey waddle out of the red construction paper. Glue the waddle under the hand print thumb. Use the black marker to draw an eye and legs. Write your child’s name and age on the back for a keepsake.